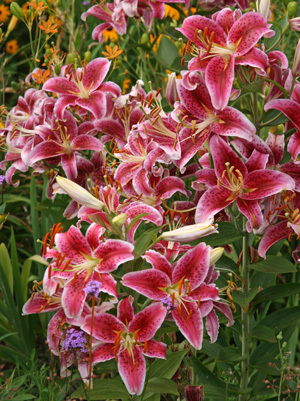 Oriental lilies are renowned for their delightful perfume and flamboyantmid- to late-summer blooms. The crimson cultivar ‘Stargazer’ is a popular hybrid with large, showy flowers that make it a showstopper when in bloom. One of the most common Oriental lilies, and one of the easiest to grow, this reliable garden performer is hardy in zones 4-9. The cultivar ‘Stargazer’ was a breakthrough in lily breeding when it was introduced by hybridizer Mr. Leslie Woodriff in the late 1970’s. The flowers of plants in the Oriental lily group tend to hang down, but this complex auratum-speciosum cross of unknown parentage was noteworthy because of its upward facing flowers, hence the name referencing looking at the heavens. 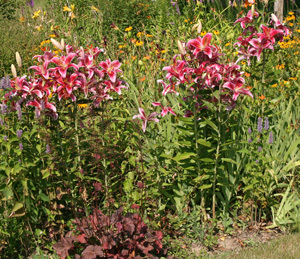 There are now many other cultivars with upward-facing flowers, in a variety of colors. Bulbs produce strong new stems each spring (L) that rarely need staking (R). Like most true lilies (Lilium spp. ), these herbaceous perennials die back to the ground in winter and send up a new stems from the bulb each spring. The upright plants can grow to 6 feet tall, although usually they remain much shorter (3-4 feet). They have strong stems and rarely need staking. The lance-shaped leaves alternate up the stems, with the lower ones often falling off as the plants grow taller. Remove the dying foliage in fall, cutting the stems off at ground level (or leaving some showing so you will know where they are in the spring before the new growth emerges). The reflexed tepals are crimson edged with pink. In mid-summer 4-12 flowers are produced on the end of each stem. This hybrid blooms earlier than many other Oriental lilies. The flowers of this hybrid are an elegant combination of pink, red and white with reflexed tips and long stamens with heavy orange anthers. The mainly crimson tepals (3 petals and 3 sepals which all look very similar) are edged in pink and spotted with darker red. The satiny flowers have a strong, pleasant fragrance, and make excellent cut flowers (and are heavily utilized by the florist trade). However, the orange pollen can stain clothing and skin, so if used as cut flowers it is advisable to cut off the anthers. The orange pollen can stain skin and clothing. Anthers should be removed from cut flowers. Once all the flowers on a stem have finished blooming, cut the stem just below the inflorescence, leaving a much foliage as possible, to make sure all the plant’s energy is directed back into the bulb rather than into forming seeds. 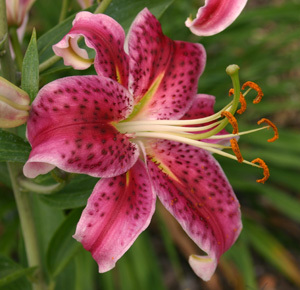 This lily is a superb addition to both formal and informal gardens, combined with roses and many other flowers. For the best effect, place them in groups of 3-5 (or more). 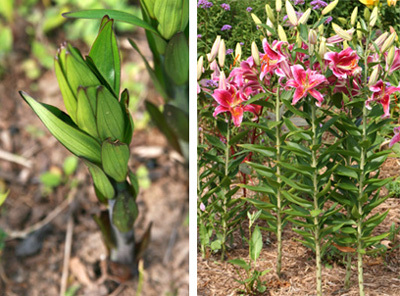 Lilies do well grown with other low, shallow-rooted plants that help hide the sometimes bare lower stems and keep the roots cool. I like the combination of the purple spikes of Agastache with the pink lily flowers, but they also look very impressive rising from a bed of ferns or baby’s breath (Gypsophila), or combined with Phlox paniculata ‘Bright Eyes’ (light pink flowers with a dark pink eye) for a monochromatic color scheme. This hybrid can also be grown in containers and is fairly easy to force. The bulbs should be planted deeply in the container and overplanted with annuals. Plant lilies in groups for best effect. Stargazer’ is very easy to grow. It does best in full sun in the Midwest, but will tolerate partial shade. It thrives in almost any type of well-drained soil, including heavy clay. Plant bulbs in early spring or fall, or potted plants any time during the growing season. They need to be planted fairly deeply – about 6”for large bulbs. Mulching will help insulate the soil, allowing newly planted bulbs to continue growing their roots into late fall, and will also delay emergence of frost-tender shoots in spring. Established lily bulbs don’t need winter protection where snow cover is dependable, but a winter mulch – applied after the soil freezes – may be beneficial in more northern areas without reliable snow cover (I have never done this in my garden on the border between zones 4 and 5, and the ‘Stargazers’ have never suffered even in snowless years). This should be removed late in the spring. A light mulch of shredded leaves, compost or shredded bark will prevent weeds from germinating and will keep the roots cool during the growing season. ‘Stargazer lily and Agastache in bloom. Fertilize lightly in early spring, if desired. 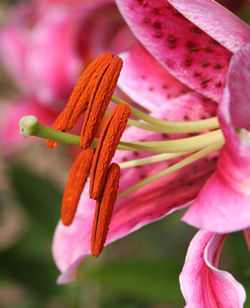 This lily generally has few pests, although voles may feed on the bulbs, rabbits may nibble emerging shoots, aphids may infest the flowers, and deer sometimes find them appetizing. Fall is the best time to move or divide clumps, when the bulbs go dormant. Handle the fleshy bulbs carefully, and replant at the same depth as soon as possible. Any smaller offset bulbs should be planted at a depth three times their height. This hybrid is easy to propagate from scales (many other oriental lilies can be difficult to propagate). Will or can my lillies Bloom again after the first flower, if I cut them back a little? No, they only bloom once during the blooming season. It would be nice if they grew another flower after I cut one off. We just planted our stargazer lily plants a few weeks ago. We bought them in pots not as a bulb. When we bought and planted them they were absolutely beautiful. Then after a few weeks we have nothing left. No greenery, no flowers, and basically just a stalk left. We live in Louisville KY and it’s very much still summer here. Have I done something wrong? I have a star gazer Lily should I cut it right back to just above the soil in winter months? 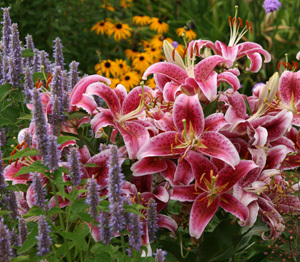 Stargazer is a very easy variety of Lily’s to grow. It thrives in any type of well drained soil. It is easy to propagate from the scales of the bulb. I have many of them in my garden and am very pleased with the beautiful display they give me. I bought some Stargazer Lily bulbs several years ago that came with meager instructions, and although they survive and bloom, I now know better how to improve their ability to winter, and how to propagate them, should I care to do so.